Demand is on the rise for heat-reflective and energy-efficient roofing systems, and Walker Roofing is meeting the challenge head-on with high performance thermoplastic polyolefin (TPO) roofing. With an exceptional resistance to ultraviolet, ozone, and chemical exposure, TPO single-ply membranes are a fantastic choice for “Green” building projects. TPO does not degrade under UV radiation and has no additional plasticizers. White TPO roofing material also helps decrease the “heat island effect” in urban areas by reflecting sunlight before it can be converted into heat. To ensure proper roofing installation and maximum results, utilize the knowledge and skills of the expert team at Walker Roofing. GenFlex TPO roofing offers the flexibility and weathering resistance of rubber, plus the versatility of thermoplastic. The seams may be either heat-welded or sealed with seam tape. TPO roofing from Walker Roofing provides strong protection and fast, affordable solutions. 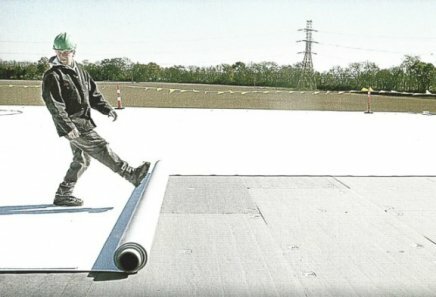 TPO roofing easily rolls onto any flat or low-sloped surface and can be heat-welded for speedy installation. The material is highly resistant to punctures, tears, leaks, and fires, which prevents a lot of maintenance headaches and repair costs. It is also extremely energy-efficient, so you can start saving money on your energy bills right off the bat. The Minneapolis TPO Roofing experts at Walker Roofing are happy to answer any questions you may have, so contact us today! Reduce your energy bills with high-quality TPO roofs in St. Paul. Call 651-251-0910! Creating worry-proof buildings & homes since 1938. You will feel safe and comfortable with our team during the entire process. Roof damage from storms? Walker Roofing handles it fast! Walker Roofing handles jobs of all sizes. The best roofing services in St. Paul, MN! ©2018 Roofing Contractor in Minneapolis All Rights Reserved.